We manage and operate the KTB site in Bavaria, southern Germany. 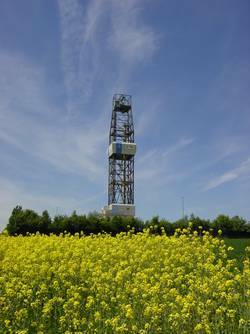 KTB was the German Continental Deep Drilling Program initiated by Rolf Emmermann between 1987 and 1994 (see history). Nowadays the KTB site with its two close adjacent boreholes (4000 m & 9100 m) is used as a deep lab with a complete downhole logging infrastructure including a workshop taylored for wireline logging. 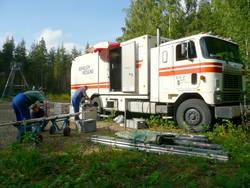 The KTB site allows in-situ high temperature/pressure testing of logging and downhole monitoring equipment and even long-term experiments for low costs. Klick here for more information. Data measured during the active KTB drilling phase 1987-1994 can be obtained here. Click on Data in the left field in violet. For data measured in the two KTB boreholes since 1996 please contact Jochem Kück.